RABBI JONATHON MARKOWITZ-MENDOZA felt like hiding under his desk. Cheryl, the receptionist at Congregation Beth Israel, told him over the Com that there was a gentleman to see him. In their private code, "gentleman" meant anything but: a hostile, or weird, or very very needy person - which was OK. That was partially what he was there for, as he saw it, to serve those in needbut it was 3:17 pm, with about three hours to go to Kol Nidre. For now, for the short term, he felt ready for anything. But not for what he beheld before him. It was a Marine apparition, a man so tall he bumped his square crewcut head bounding through the door, and so old that the arthritis in his back was evident in the way he winced as he stood to attention. He wore an Old Navy type crew-necked black top, with a genuine Old Army Eisenhower jacket, drabber than any olive, with a rectangle of medals and ribbons covering the khaki area of his heart. His shoulders were high and broad, his waist was slim and trim and he wore black nonmilitary stovepipe trousers. His face was crisscrossed with wrinkles. He extended a large, gnarled, clean, and callused hand. "Hello Rabbi, I'm Hank Eastman; I'm sorry to bother you at a special time, but I have a big problem, and it's related." "Sit down please, Mr. Eastman," the rabbi said as he extended his hand, "I'm Jonathon Markowitz-Mendoza." "Thank you," Mr. Eastman said as he sat ramrod-straight at the edge of the rabbi's study's well-upholstered checkered couch. "I've got to begin right at the beginning." "Do you have any licorice?" Rabbi Jonathon asked. "No, sir, do you need some?" "No, I just thought I smelled some." And he did. But it was some kind of olfactory hallucination, a memory of a little girl who sat ahead of him in Second Grade at PS 46 Elementary School. She was the cutest little thing. Everything was black and white with her. She had a fair complexion, but the deepest black hair he had ever seen. She had black button eyes, always bright and sparkling, and she was usually smiling, or laughing, at some joke told or implied. Her hands were usually black, from the inkwell ink, or from the licorice candy she was forever chewing. She was always offering Jon some, but he was put off by the ink. "Nope. I don't care for licorice, and it's bad for the blood pressure, I wouldn't advise you to indulge in that, Rabbi; frankly speaking, you're a little plump." "Of course," Jonathon said. "Wait a minute. Ink. Ink. I can't tell the smell of ink from licorice, because this little girl, in school, she always had her hands in both." "I see, Rabbi, I know just what you mean. I am a part-time printer. I have a piece of the shop, with my nephew. We're the only letterpress job printer left in the city, maybe in the world. So yes, we have that ink." "Yes, but your hands are so clean." "Cleaner. Comes in a jar. Looks like cold cream. " "Forget it. It's just that I never understood how she never got any on her clothes." "Licorice and ink. All over her hands, but not her clothes. My clothes were always full of ink smudges." "Girls. Women. They're immaculate about what they want to be. That's why I came to see you." "I'm sorry, Mr. Eastman, we did get off the track. Please tell me about it." "It's about a vow I made when I was on the beach at Iwo Jima during the big war." "You were at Iwo Jima." "Yep. I didn't quite raise the flag, but I was there, shooting and falling." "Going to be Eighty-Four in November." "And what did you vow, if you can tell me?" "Well, I got a letter. From a friend. First of all, like I said, we were young. Sixteen. We had to get our folks' permission to get married, and then for me to go in the Marines." "If you were underage, you weren't drafted." "No, and we had a baby. I could have been deferred when I was of age." "So then, naturally, I ask why you went?" "Well, as you probably figured, we had to get married." "We were too young. But she was too talky. She'll always be too talky." "A friend. Told me Vera was fooling around with a 4-F."
"Sounds funny, mail at Iwo Jima, then Okinawa. But after the smoke and blood was Occupation. Time for writing." "As usual. But I didn't confront her in the letters." "Yeah. I was pretty God-damned sure after that." "Yes, Sir. Sorry. I'm remembering where I am now." "Yes. Well I made a vow then . . . and this is the time to cash out on vows, isn't it?" "Kol Nidre. Yes, in a way. It's looking ahead to vows made in the coming year, nullifying them, or looking backward a year. Looking back sixty-some years, I don't know how literal we are on that." "Well, tell me about your vow." "I vowed I'd leave her. After Junior finished high school." "Because of this alleged infidelity?" "Sort of. And because she was always yapping too much. Yap yap yap yap. So I vowed that I would leave the first time she opened her mouth too many times in a row after the baby graduated high school." "Well, these kids with their education kick these days. He wanted to go to college." "This was in the late Fifties?" "What happened when he finished ?" "Med school. He became a doctor." "Even so, he must be over sixty now?" "Sure, but we had four more. The youngest just got her doctorate; she's thirty-eight." "Does that mean you feel you must fulfill your vow?" "Well, if you were that unhappy with your wife, why did you have four more children, and why did you wait until they all finished advanced studies?" "A man's got to take care of his family, doesn't he? And none of them moved out until they got married." "There is something missing in your story." "Your relationship with your wife. Did you want to leave your wife all this time." "Hell, no. Sorry Rabbi, it's just that she's the best damned woman . . . Oops, let's just say the world's best woman." "So that was part of your reason for staying? It wasn't just that your children remained in school and at home?"
. "Of course not. I love my wife." "Did you ever tell her about your vow?" "Are you kidding? She'd throw me right out." "Then we are back to Square One. Why have you come here today?" "To find out if I have to leave her now." "Why now?" the Rabbi asked. "Betty got married, moved out. And I heard you do a great Kol Nidre service." "Thank you. You're not a member of our congregation, are you." "No Sir. Haven't been to shul since before the war." "You are Jewish, you were Bar-Mitvahed?" "Yes, but then I lost touch, or faith." "My wife takes vows very very seriously." "I see. Why, exactly, precisely, do you need to deal with your vow now; outside of the last child leaving the nest?" "My wife slipped that one time, and never confessed. Now she did confess, to the priest, and then to me. We're coming up on our Sixtieth Wedding Anniversary. We want to renew our vows, nondenominational, of course. And so she wants to get clear, and so she wants me to confess anything important to a rabbi, and to her. But I can't tell her, because her feelings would hurt so bad, and because she'd think I had to leave because vows are not made to be broken." "Well, what can I do, should I call the priest and see if we can work it out?" "That would be great. But you're kidding . . ."
"I'm afraid I am, Mr. Eastman. There are better jokes about Kol Nidre, though. But first tell me the exact words of your vow." "I said, 'I swear to God the first time she yaps too much after my boy finishes high school it's going to be goombye.'" "You felt you were making this oath to God, or to another person, or to yourself?" "To God, between me and God." "But do you believe in God, or was that just a figure of speech?" "I believe I do believe in God. My faith is weak in synagogues and other houses of worship, I guess." "But you can't deal directly with God?" "Not on this. You see, I'm not perfect, but I'm OK. There's not much in the whole Al Heitsee, I remember the prayer that I feel very strong about. I'm not a great sinner, or even great omitter. I need help now, because I feel bad for making the vow, and for not keeping it, and for not forgetting about it either." "I'm not an intermediary, Mr. Eastman. I'm not a priest." "Thank God, pardon the expression." "Your predicament is in the time frame, of course. But Kol Nidre, and the whole Yom Kippur experience, will help. There are a few standard jokes which apply." "I'm not in a funny mood." "First, there's the one about the squirrels . . ."
"Squirrels. In this one small town, all the religious buildings became infested with hordes of squirrels. And each faith had a different response." "The Presbyterians felt fatalistic about it. They said it must be God's will, and they lived with it. The Methodists, on the other hand, felt very compassionate toward the squirrels even though they wanted to get rid of them. So they set a bunch of Havahart traps, painlessly ensnared the squirrels, then drove fifty miles out in the country and released them. The next day they were back. "The Jews, on the other hand, had a different approach to saving the synagogue." "They called an emergency meeting of the board of directors, pondered the situation in an open meeting, and by acclamation they voted all the squirrels into full membership in the congregation. After that they only saw them twice a year." "I don't get it," Eastman said. "The High Holy Days. Yom Kippur and Rosh Hashanah." "I know what the High Holy Days are. But I don't get it." "Synagogues these days are full of members who only show up on the holidays." "Oh. I think I'm out of touch." "I know you're out of touch. When you were a boy, you went to synagogue?" "Shul. We all went to shul at least once a week, many every day. I thought it was still that way." "How can people waste their money? You have people pay four figures in dues, I hear now, for the fancy shuls, and how can they get their money's worth coming twice a year?" "How many times I've asked myself that same question, Mr. Eastman." "Now when I was a boy it was the Depression. You didn't have money to throw away. If you paid dues you took advantage . . ."
"B'Nai David, in the Bronx, Hunt's Point." "The congregation is still there?" "Far as I know. I think they have a new building." "That gives me an idea. Bear with me," the Rabbi said as he leafed through a synagogue directory. "What year did you make that vow?" "Hello, yes, this is Rabbi Moskowitz-Mendoza at Congregation Beth Israel, can you please tell me if you have records going back to 1944. Regarding what? Kol Nidre. I know it was War Time. Did you hold Kol Nidre services in Forty-Four? You always do, I'm sure. No, you are not old enough to recall personally, but the congregation is over a hundred years old. Just to be sure, would you look it up? It will take maybe five minutes? I'll hold, if I may. I know, you're getting ready for Kol Nidre. So am I here . . ."
"We're on hold," the Rabbi continued in a stage whisper to Mr. Eastman. "You know, on Kol Nidre the congregation defines itself as a court, pleading together for forgiveness for the transgressions of everyone in the group, releasing everyone from their ill-considered vows. "Excuse me," he said as the voice resumed on the other end of the phone. "You had a log. People signed in on Kol Nidre, as if at a wedding or funeral. Couldn't that be considered blasphemous, a poor competitor with the Book of Life? Yes, it was finally decided so. But your rabbi at the time, Reb Bernstein, he referred to the Court on High and the court below, and the fact that it was war time, the Shoah was still raging, the congregants needed to write themselvesand their relatives abroadin captivity, and fighting, into Life. You have the book? Any Eastmans there? Oh, an Isaac Eastman?" "And what looks like Patricia? Patricia Eastman?" "Patty? She never . . ." Eastman began to say. "Does she dot her eyes with little circles, they asked?" "Yes. Yes. They say it's in fancy script stating, 'Patricia, for Hank!'" "Mr. Eastman, your Godand your wifeabsolved you in 1944. You definitely do not have to leave your wife." "Oh, my God. I never was going to . . . but?" "But you were going crazy about it. Even if this visitation by Mrs. Eastman had not occurred, the spirit of Kol Nidre would have absolved you." "Right. Right. But I'm a printer. I go by the book." "L'Shana Tova, Mr. Eastman," the Rabbi said, shaking his hand. "Now I can tell you the other Kol Nidre joke. This was actually overheard in a synagogue of my acquaintance. A very well-dressed couple were whispering loudly together as the Kol Nidre chant began. 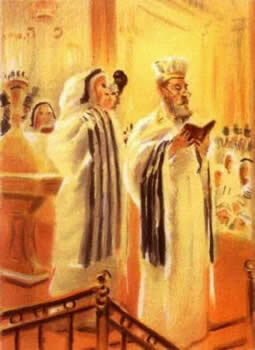 'Kol Nidre, Kol Nidre. Every time we go to Temple it's Kol Nidre. Why don't they try something else for a change?'" Eastman didn't laugh, nor did he cry. He squeezed the Rabbi's hand until the bones ached; and the Rabbi smelled licorice, and ink.